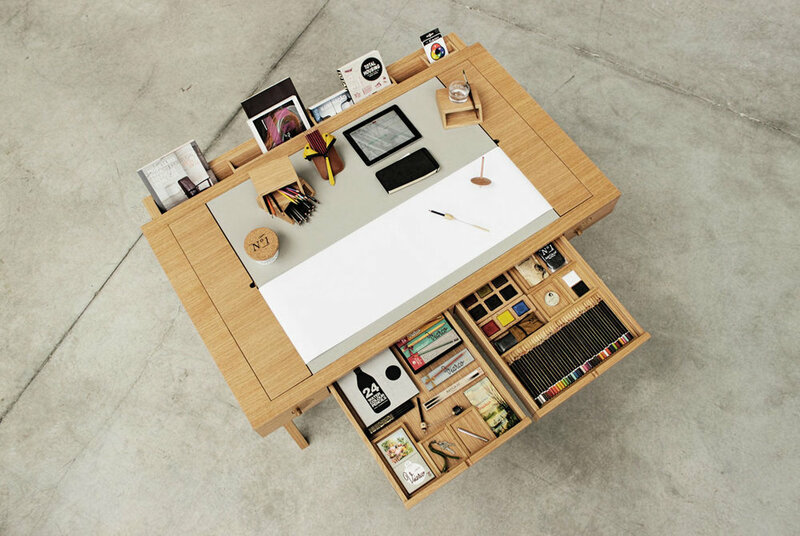 The 111-year old Portuguese pencil stalwarts at Viarco tagged the digital design studio Digitalab to create a simple-yet-clever drawing desk. Unveiled last month during the Stockholm Furniture Fair with Associative Design’s “Best of Portugal” installment, the solid oak desk features two deep drawers with a pile of small modular compartments to divvy up storage space, a standup rack for books, an iPad or loose sketches and the big ticket selling point, a wheel-and-spindle paper roller that covers a quarter of the desk space in white sheet paper, and creates a sort of creative analog hard drive (it can store up to 25 metres of paper). The finished design isn’t available just yet for purchase.